How Much Water Should I Drink to Avoid Dehydration? When it comes to water, people often ask how much water to drink for optimal health. why the "8 glass a day" rule is wrong? Or the benefits of taking salt before water? 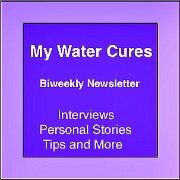 First we will review the Water Cures theory. Then will look at the science behind the theory of proper hydration. Following this will be the Five Rights of proper hydration. First and foremost, 'Don't go crazy and Don't become Fanatical.' Listen to your body and if you change your hydration habits, do it slowly so your body can adapt. There are many scientific and doctor recommendations on the web but they lack clinical trials or evidence-based testing to back their claims. That is, except for one recommendation, ours. We are constantly studying, measuring and trying to perfect the answer to how much water to drink, and when it is best to drink. We have further developed the theory first identified by Dr. Batmanghelidj. The doctor/science recommended amounts fail to address needs based on body weight, size or age. Ask yourself this question: When you read that it is recommended people drink xyz ounces of water a day, does that mean that a 4-ft-tall person needs the same amount as a 6-foot-6 person weighing 400 lbs? Does an 80-year old need to drink the same as a 15-year old of the same size? 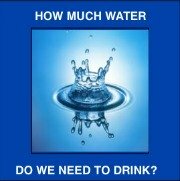 Answering the question of how much water do I need to drink, we need to ask, how do we account for body size? More importantly, how do weight, age, and activity factor in? Even in activity, the research does not support the recommendations. In the 2003 Boston Marathon, the recommended amount of water to drink was 400 to 800 ounces of water per hour. The answer to the how much water to drink is not as simple as one simple answer. The amount of water and salt we need varies based on body type, health status and our activity level. In nursing, it is called fluid and electrolyte balance. So, it is not important just to drink more water. We also need salt. And considering that many people have lived to old age without using the water cures protocol, we realistically have to say, the Water Cures is not a cure all. It is however a solution for better health for the majority who embrace it. So, How Much Water To Drink? The following is the baseline water needs. Age 2-17 daily minimum need is 75% body weight in ounces of water. Divide by 5 or individual dose. Take a pinch of salt dissolved on the tip of the tongue each time you drink. Age 18+ daily minimum need is half the body weight in ounces of water. Divide by 5 or individual dose. An easier way, 10% your body weight each time you drink. Start with 2x and work up to 5 times. Take a pinch of salt dissolved on the tip of the tongue each time you drink. Here is the break down and those who should not use this. Please read this entire section to find your specific need. NEVER: drink more than 32 ounces in 2 hours. NEVER: drink the water without taking the salt (unless otherwise directed). Too much water could wash out the electrolytes needed for normal health. NEVER: Use the protocol if you have kidney disease without talking to a doctor. NEVER: Use the protocol if you have congestive heart disease (CHF) or other fluid restrictions. 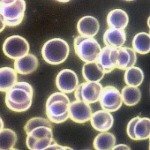 NEVER: use the protocol if you have a salt intolerance. Right Person: age 2-17 / 18-50 / 50-80 / 80 and older. Right Time: 30 min before and 2 hours after meals. Right Route: Dissolve the salt in mouth so it can be absorbed in the mucous membranes. 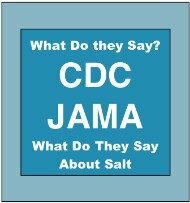 Right Amount: Salt: 1/8th tsp per 16 ounces, water: 10% of body weight in ounces of water each time you drink. Why Dissolve the Salt On the Tip Of Your Tongue? Some drink water with salt in it. This is called Sole. It can and will make many people sick to their stomachs. Putting the salt on the tongue will allow it to get to the blood faster so that when the water arrives in the gut, it will better be able to be absorbed. 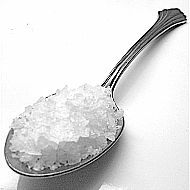 Right Electrolyte: While normally this would be unprocessed salt, it could include others depending on your health issues. Right Person Age 2-17: If there are any health problems, do not use the water cures protocol without supervision of a healthcare provider. The growing years...According to Dr. B, the formula is 75% of their body weight in ounces of water is the total daily dose. Then divide by 5 or 6 for individual dose. During athletic performance, the hydration need goes up to 100% of their body weight in ounces of water. Right Person Age 18-50: Start drinking the water 2 x a day (within 20 min of waking) and slowly increase. Right Person Age 50-80: Start off slower. Use the least amount of water and the least amount of salt. Only start off drinking one time a day. Then after a week, increase to 2 times a day. Allow up to 30 days before increasing the amount of water you drink or the salt you take. Right Person Age 80 and over: Only start with the help of a healthcare professional. You should be monitored for health changes. Right Person 18-50: If you do not have any other health issues, this age group usually responds to the basic water cures protocol. Right Route: Obviously you are going to drink the water. The electrolytes are another story. Some prefer putting salt in the water. This may make you sick to your stomach. Others prefer putting the salt on the tongue and letting it dissolve. There is a third way that also makes sense. When adding a tablespoon of liquid chlorophyll to the last drink of the day, adding level teaspoon of honey and 1/4 tsp of salt into the glass, blend into the water, and it will be more easily absorbed in both your mouth before swallowing and in your gut after it goes down. Note: By using the oral route, the best way to make it most effective, hold each sip in the mouth and allow your saliva to mix with it as well as some of it to be absorbed. Right Amount: This is broken down into four answers. There are individual doses, daily doses and doses for those highly active or in very hot or humid conditions. Drink the water all at once. Do not nurse your water. Think of your body as holding it rather than holding it in a bottle. The salt is what allows your body to store it. One thing to note, many start losing weight. Sometimes the weight loss is dramatic. 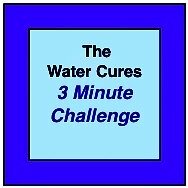 The amount of water we need will gradually decrease as you follow the water cures protocol. First: Never drink more than 32 ounces at one time or inside of a 2-hour period and never drink that much without salt. 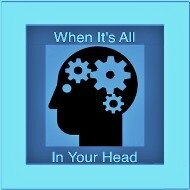 Individual dose: At a normal activity level, 10 percent of your body weight in ounces of water. So If you weigh 135 lbs, you would drink 13 ounces. If you weigh 190 lbs, you would drink 19 ounces. Ten percent in ounces is basically the first two numbers of your weight if you are over 100 lbs and the first number if you are under 100 lbs. This is the baseline amount you need to drink. If you are active, you will need to drink more depending on the intensity of what you are doing. There is science on drinking more. Urine Volume and Change in Estimated GFR in a Community-Based Cohort Study. Conclusions in this community-based cohort, decline in kidney function was significantly slower in those with higher versus lower urine volume. Right Time: 30 to 45 min before meals, 2 hours after meals. The reason is simple. When we drink water and take the electrolytes on an empty stomach, the water more readily goes through the stomach and enters the gut. From there, it returns to the stomach through the blood circulatory system and prepares the stomach for the soon-to-arrive food. The preparation includes both having everything ready for the production of hydrochloric acid and the creation of the mucous lining for the arrival of the food. Additionally, any old salts are washed out of the stomach. In addition to being the best practice of hydration of the body and to avoid diluting the stomach juices, drinking before allows the stomach to better prepare for the meal. If you are doing water to lose weight, drink as soon as you get up. Ideally you want to drink your water and dissolve the salt in your mouth within 20 minutes of awaking. Likewise drink at least 20 minutes before bed. 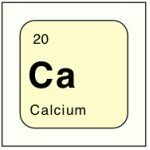 Right Electrolyte: Normally the Water Cures protocol suggests using unprocessed salt. However, there are exceptions. While we do not understand the reason why, some fine ground sea salts tend to have less mineral counts than the coarse salts. This may be due to oxidation from exposure to air. So we recommend the coarse sea salt as perhaps the best. And not all sea salt has the same mineral counts. It must be unprocessed. The best way to know, look for the mineral count. Mined salts likewise are rich in minerals. Some prefer one over the other. The best way to find out which works best for you is to try both or even switch back and forth. Sometimes we may need additional electrolytes. Your doctor would be in the best position to tell you if you should use any others, how much and how long. This is a work in progress. We will continue to study and define the answer to this question. One thing we do know, when there is illness or disease, the water cures protocol can help some to reset their health. Please share your experience or questions to help us grow this knowledge base.